By Adrienne Rivera. Apr 5, 2019. 9:00 AM. Ernest Hemingway (1889-1961) is universally considered one of the most important writers of the 20th century and certainly one of the most influential writers of the American literary canon. Hemingway's career stretched over three decades of war. He wrote travel journalism, seven novels, numerous novellas, short story collections, and works of nonfiction. His novels For Whom the Bell Tolls, A Farewell to Arms, and The Sun Also Rises are considered to be some of the most important works of literature written in the English language. Hemingway's style has served as an influence to generations of writers and has helped form the landscape of modern American literature. He was awarded the Pulitzer Prize and the Nobel Prize in Literature, two of the highest honors a writer can receive. His work has been adapted numerous times for both television and film. One of the most notable adaptations of a beloved Hemingway novel is the 1958 film adaptation of The Old Man and the Sea starring Spencer Tracy. Hemingway published The Old Man and the Sea in 1952 at a time when he was considered—both by himself and the wider literary community—to be somewhat washed up and irrelevant. His last book had been a commercial flop, and due to personal struggles with his mental and physical health, he did not think he would not achieve much success with further novels. So he wrote something different than his usual fare, straying away from the wartime narratives that had been so well received in his earlier novels, and focusing instead on one man and nature. The resulting novel was The Old Man and the Sea. The book earned immediate critical acclaim and was an instant success. Hemingway was once again a highly praised name, and the success of The Old Man and the Sea funneled into his other books, too. Gone were any naysayers suggesting he was a "has been." He won the Pulitzer Prize for the novel the very next year. The year after that, he was awarded the Nobel Prize for contributions to literature, and his narrative style was praised. Notably, the announcement of the award specifically mentioned The Old Man and the Sea. The book was an instant classic, and if Hemingway wasn't already a legend in American literature, this novel cemented his place as such. The Old Man and the Sea was adapted into a movie in 1958. The cast and crew were impeccable. The film was directed by John Sturges who is known for his directorial work on The Magnificent Seven and The Great Escape. Sturges replaced four-time career Academy Award winner Fred Zinneman, who directed Oklahoma! and From Here to Eternity, after he stepped away from the film. The titular old man was played by Hollywood Golden Age legend Spencer Tracy (Boys Town, Northwest Passage, Guess Who's Coming to Dinner). With such an impressive team working on the film, it was poised to be a massive success. It even had technology on its side. The film was one of the first to utilize blue screen technology, a method in which pre-filmed backgrounds could be added behind actors on a sound stage. Yet all the potential for greatness somehow did not translate into a film that was met with much praise. Critics and audiences agreed it was sort of a dud. Perhaps it was due in part to Zinneman backing out of the film and the search for a replacement. After all, while Sturges stepped into the role of director and succeeded in putting the film together, he said that he considered the film to be one of the sloppiest pieces of work in his career. While the original budget for the film was $2 million dollars, it quickly ballooned to $5 million. Much of this increase was due to the attempt to find good footage of marlins. All of Tracy's parts were filmed entirely on a sound stage. Images of Cuba and the marlin were edited in using the blue screen technology. The end result was too small scale. To audiences, the ocean ended up feeling like just a few feet of water on a sound stage. The epic battle between the old man and the marlin was never actually shown from a wider angle. The film depicts Tracy struggling with the fish, then cuts to the marlin, and back and forth for the entirety of the interaction. To critics, the battle felt less real because of it. 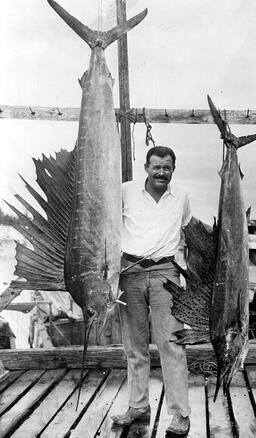 Tracy was never filmed actually fishing and never appeared with a living marlin, likely due to safety concerns. But it read as false. The film did earn some praise, however. Tracy's performance was widely considered to be excellent and most viewers and critics agreed that he carried the film well in despite being frequently alone, and for the most part, having no other actors to play off. The sound track received considerable praise, as well. It is also considered to be the most faithful adaptation of a book ever made, with nearly the all the events in the book depicted in the film. The most important positive review that the film received however, came from Hemingway himself. While the writer did have a few qualms with the film, he overall enjoyed it and praised the attempts of the director and Tracy, as well as the overall cinematography and the way the fish itself was handled throughout the film. The Old Man and the Sea is one of Hemingway's most important and best loved novels. Though the film did not quite measure up to the overall adoration and acclaim of the book, it serves as a solid example of Tracy's inimitable talent. Though later adaptations were made of the book, namely an animated short in 1999 and a miniseries starring Anthony Quinn in 1990, the 1958 film is notable for being the first and the most loyal. Fans of the book as well as fans of Spencer Tracy would do well to check out the film for what it does do well: depict a man battling with nature to prove his own worth to himself.